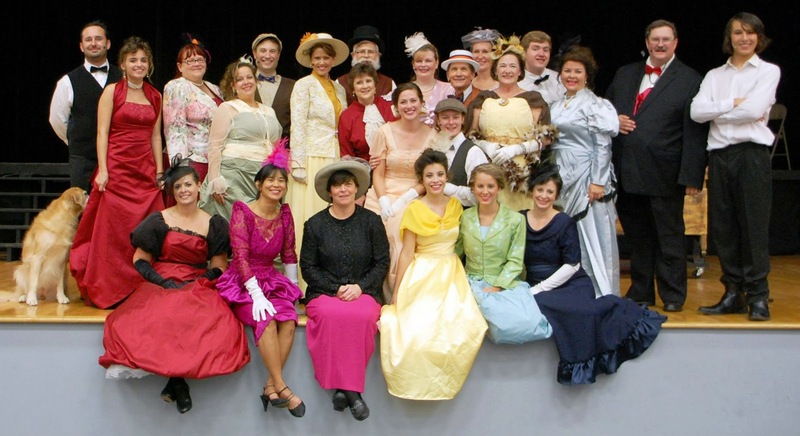 Recently Runnels Theater for the Performing Arts presented Hello, Dolly! My friend Steve Lalande posted on Facebook that he wanted his friends to come see the musical and watch him in the role of Cornelius Hackl. A few of us got tickets and went. It has been great getting reacquainted with Steve from our 1960's years at Istrouma High School and a thrill to see him on stage with his surprising talents. Runnels produces a series of shows during the year including one featuring community actors and it was Steve's debut on that stage. Those of us who attended agreed that "our own" Steve cannot only act, but sing and dance as well. His return to Baton Rouge from 34 years of living in the Los Angeles area, was a prelude to his return to the stage. By day he works as an Office Assistant for Taylor, Porter, Brooks and Phillips, the oldest law firm in the Baton Rouge area. Working for the law firm is his second career. He worked for many years as a professional actor. In a recent conversation, Steve confessed his shyness during high school, which was when I knew him last. Forty five years ago he had never been on a stage nor had he ever seen a play. In 1969 Steve hitchhiked to Los Angeles to visit his sister, Priscilla who is also an IHS graduate, class of 1967. He stayed a couple of weeks and saw Hair at the famous Aqaurius Theatre. The then controversial rock musical made a huge impression on him and he became enamored with theater after seeing the performance. When he returned to his studies at the University of Louisiana at Lafayette, he wasn't so sure he wanted to major in computer programming after all. He made no changes, however, but found that he needed an elective course for the semester. His friend, Mike Stewart (IHS grad 1965), talked him into taking a theater class because: "The prettiest girls on campus take those classes." That was the beginning of his show biz days. His friend's suggestion turned into a life changing choice. 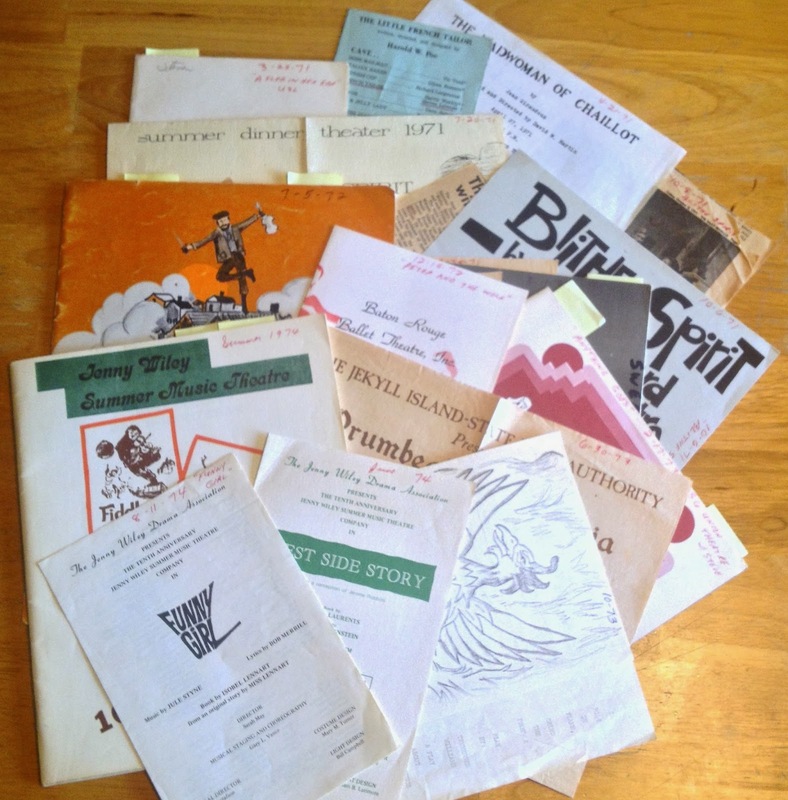 His first performance was in 1971 for Lafayette Little Theater. Later that same year he was featured in the leading role of the university's production of The Little French Tailor. 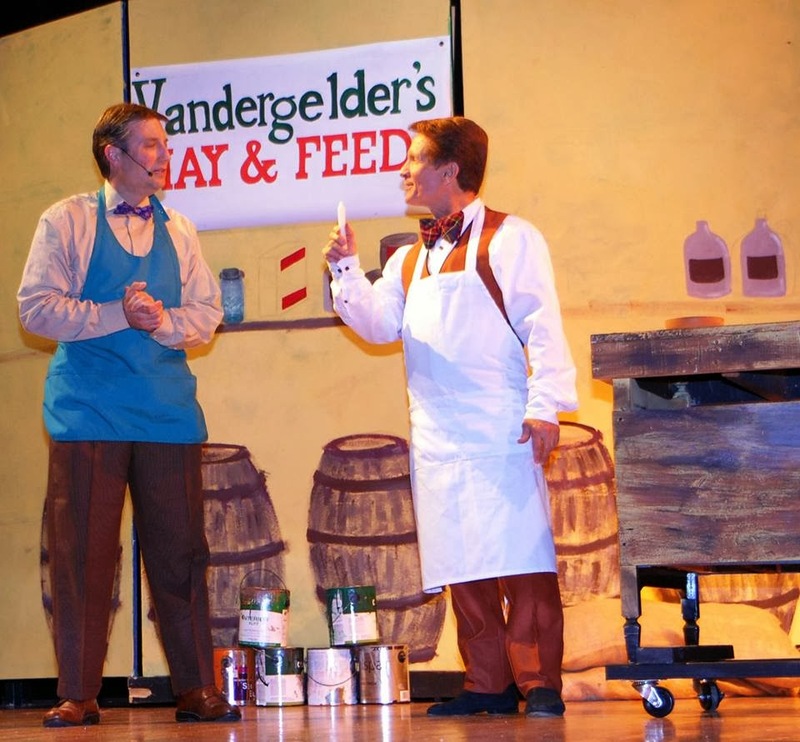 A transfer to Louisiana State University in his junior year found him on the stages there as he worked toward and received his Bachelor of Arts in Theatre. 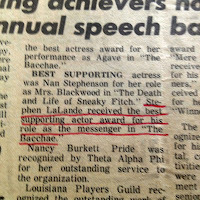 In his first performance at LSU he distinguished himself by receiving the Best Actor Award for his performance as the Messenger in The Bacchae, a Greek tragedy. Under the coaching of Gresdna Doty he won the role of Dr. Bradman in Noel Coward's Blithe Spirit for which he received great reviews. 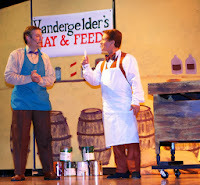 Baton Rouge Little Theater's production of Fiddler on the Roof found Steve as a Bottle Dancer. (The link is from the movie, so you can get the idea of the significance of being a Bottle Dancer…quite impressive stuff to say the least!) He studied dancing under Elissa Fuchs and also had the role of Peter in the Prokofiev ballet, Peter and the Wolf. A star was born!! 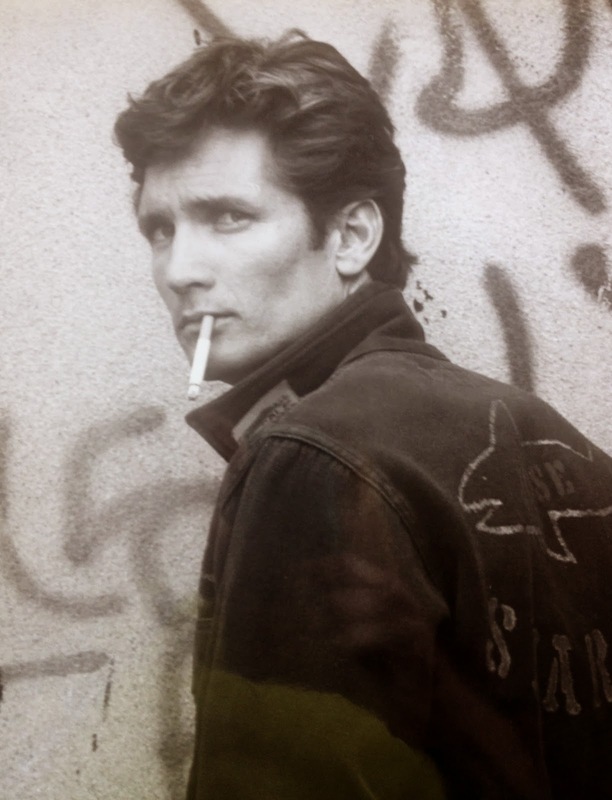 After his college years, he auditioned for and won roles in various regional theaters. 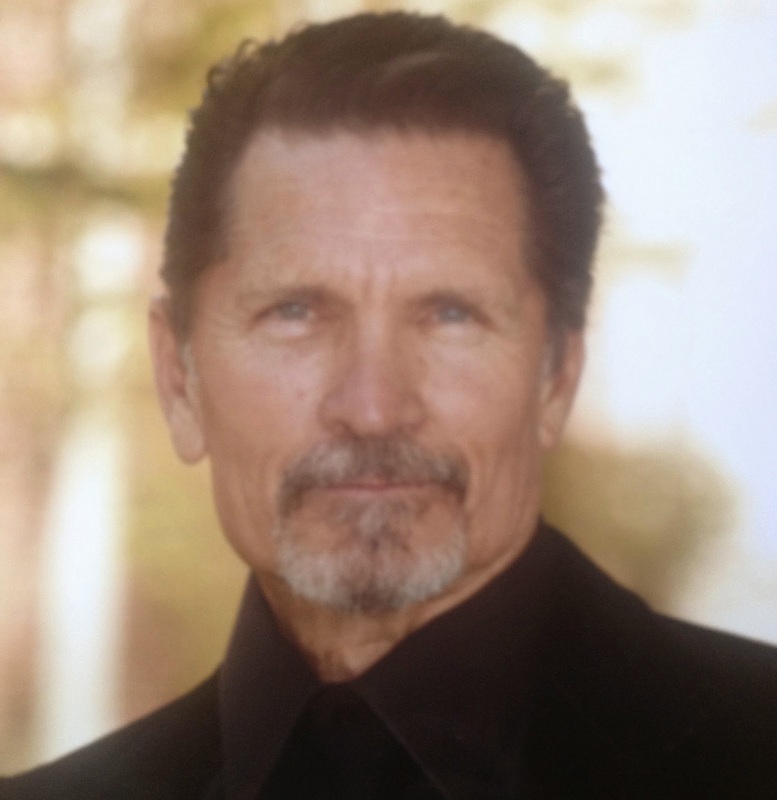 His first professional role was in Drumbeats in Georgia by Pulitzer Prize Winning play writer, Paul Green, in Jekyll Island, Georgia. He also toured with the American Living History Theatre in the role of Alexander Hamilton. I recently looked at Hamilton's picture on a $10 bill and it was "Steve." 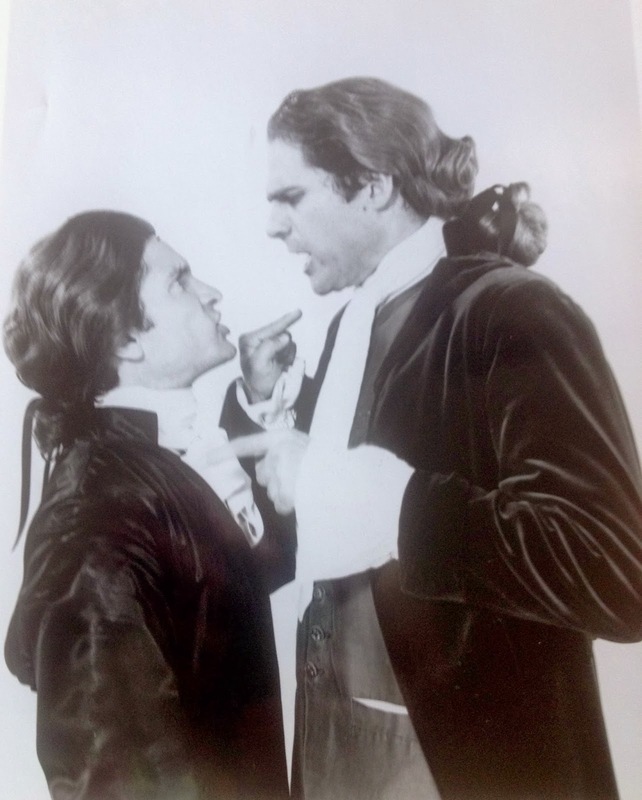 He joked that he became Alexander Hamilton during those three years in that role. He also had the role of Albert Einstein in Cabaret Dada directed by Buddy Ebsen. In 1974 he returned to California for a month's visit with his sister that turned into 34 years. He was lured by the acting opportunities and got an agent. (This photo is a picture from his original portfolio.) He had roles on television in Benson, Three's Company and even a commercial for truck bed liners. It was a living! After his one appearance on Benson that aired on nationwide television, he was recognized on the street several times by people who had seen him on television. He had a one word line, but it was memorable and funny! While many of us were at home raising kids and working at our various occupations, our friend Steve, was in Hollywood appearing on television and on stage. He once auditioned for the lead in a television series, Half Nelson. The audition call was for men with leading man looks and short stature. He made it to the finals only to lose the role to Joe Pesci, an unknown at that time. Entertainment Tonight did a clip on the auditions because the actors all had to be under 5'5". Steve was in good company. Other actors meeting those requirements are Dustin Hoffman, Joel Gray, Danny Divito, Michael J. Fox to name a few. His self professed claim to fame was his four year stint (1981 to 1985) as Steve the Waiter in General Hospital. After 50 episodes of waiting tables and pouring bubbly, Steve had his first speaking role on the soap opera. He brought a telephone to Dr. Quartermaine who was dining in the Haunted Star Nightclub and said: "Telephone call for you, Sir." Steve showed me a short DVD compilation of his 90 appearances in General Hospital, and that, he jests, was his most frequent line. He quipped, "Seems that every one wanted a phone!" Actors know the significance in "hitting your mark" while performing. In one of his speaking roles he overstepped the mark and ended up between the camera and Stuart Damon (Dr. Quartermaine). Steve was impressed by the kindness of Damon, who instead of yelling "Cut", just leaned over around Steve the Waiter to say his lines. This was a prime example of how genuinely nice the actors were to their fellow cast members. As Steve the Waiter, he got to meet Elizabeth Taylor, John Stamos, Sammy Davis, Jr, Rick Springfield and many other stars who had cameo roles on General Hospital. The romance of Luke and Laura was a great part of his own life. In 1985 Steve was working as a Film Industry Courier and one of the clients for script delivery was Julie Andrews. He was eventually hired to work exclusively for Julie and her husband, movie writer and director, Blake Edwards as a driver for their family. That association turned into a position as a Production Coordinator, Assistant Director and Production Assistant for Blake Edwards on seven films. He was the Production Assistant on Bruce Willis' first movie, Blind Date with Kim Basinger. He had the privilege of meeting and working with all the stars in those movies including John Larroquette, Jack Lemmon, George Carlin and James Garner among others. 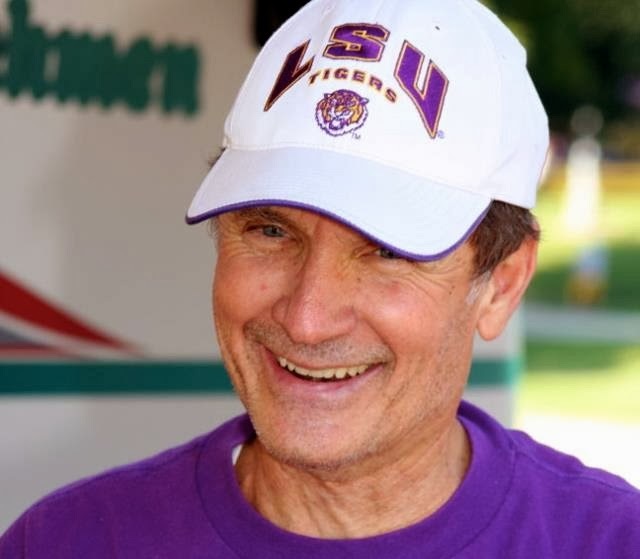 In 2009, Steve returned to his beloved Louisiana. He missed acting and auditioned for Hello, Dolly! because a colleague encouraged him to do so. He reluctantly showed up and was the last to try out for the chorus. After several days of no contact, he decided he had not won any part. Imagine his surprise when Director, Ann Dalrymple, emailed him with an offer of a role. She had a keen eye, as he was perfect for the part of Cornelius Hackl. His debut on the Runnels stage caused him great exhiliration only found in performing. As Cornelius Hackl, he demonstrated that he had not forgotten his craft. He sang and danced with ease and apparent glee. The minute he appeared on stage I knew I was in the presence of a true talent. His confidence and stage presence were reassuring. He nailed the character. Costumed in a bright orange wide lapel three piece suit and a matching hat, he was transformed into a hay and feed store chief clerk who had never experienced the big city and a love life! And who knew he could sing and dance? My favorite of the songs he sang was It Only Takes a Moment." When I praised his singing he said: "Well, it wasn't Michael Crawford." I thought it was just as superb! After all those years in Hollywood he brags that his finest part is being the father of his daughter, Emily. Emily is a beautiful young woman who from childhood was in television commercials. Her theater interest led her to win the role of the voice of Peppermint Patti in an animated Charlie Brown Valentine special. 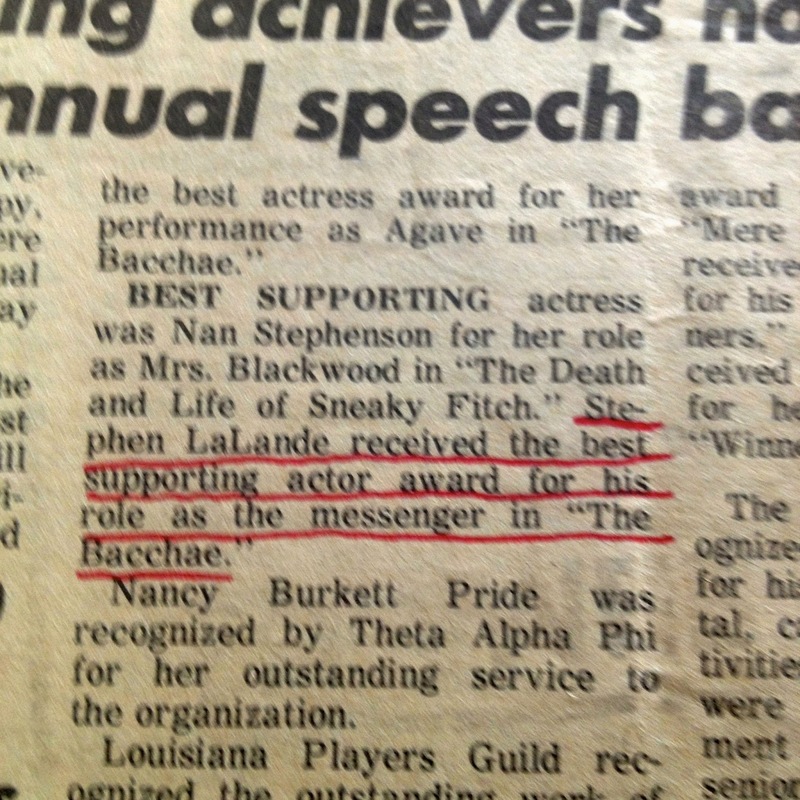 She, too, has "retired" from acting is is pursuing the profession of teaching. 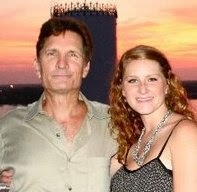 She and her dad are very close even though she still lives in California. I, for one, am looking forward to seeing Steve Lalande on other stages in the area. He told me that performing "gets in your blood" and it must be pursued with passion. The audition, the rehearsing and the performance are very fulfilling. It's hard work, but worth it in his opinion. He endeavors to "use creative expression to move and inspire the audience," and I believe he is most successful in doing that. Baton Rouge and Louisiana are lucky to reclaim one of their own. Welcome home, Steve. Break a leg! Having seen Steve onstage, I could clearly visualize his presence in other shows through your excellent article on his amazing career. Kudos to both of you. Thanks for reading!! Glad you liked it.